What you’re about to read may be the most ridiculous conversation I’ve ever had. While it’s often apparent that I’m in a different place in my life as a “mature” backpacker (read: over 19), I’ll be keeping an eye out for my AARP Card after this one. And you know what? I’m totally OK with that. Matt and I spent two days in Vang Vieng and Hailey is a ghost from party-days past (she’s been in VV since just after high school four years ago; her poor mother). The small riverside town was the epicenter of the Lake Havasu-esque tubing party scene until last spring. Each day hundreds of backpackers would rent inter tubes to “float” down 4km of the Nam Song River, partying at rickety bars all along the way. Stories of lethal moonshine and Aussies drunk by 9am abound and the river turned deadly for many who tried their hand at catapulting off of zip lines into the murkey water. A staggering 27 tourists died on the river in 2011 alone, and in response all but two of the bars have been closed and the zip lines have been benched. While tubing is still on offer, it’s now a more subdued and “one-with-nature” experience. Naturally, I had to see what all of the buzz was originally about and so Matt and I hit the river at around 2pm on Sunday. After the initial ungraceful mounting of the inter tubes, we were off and it was sweet! We slowly floated along and stared up at huge limestone karsts that burst up from the ground all around us. The water was quite low and occasionally we had to assume the “plank” position to avoid bumping our butts on the rocks. Other than that, and the final scurry to return our tubes in time to get our deposit back, it was a peaceful and fun adventure that I would recommend to anyone planning to visit Laos. 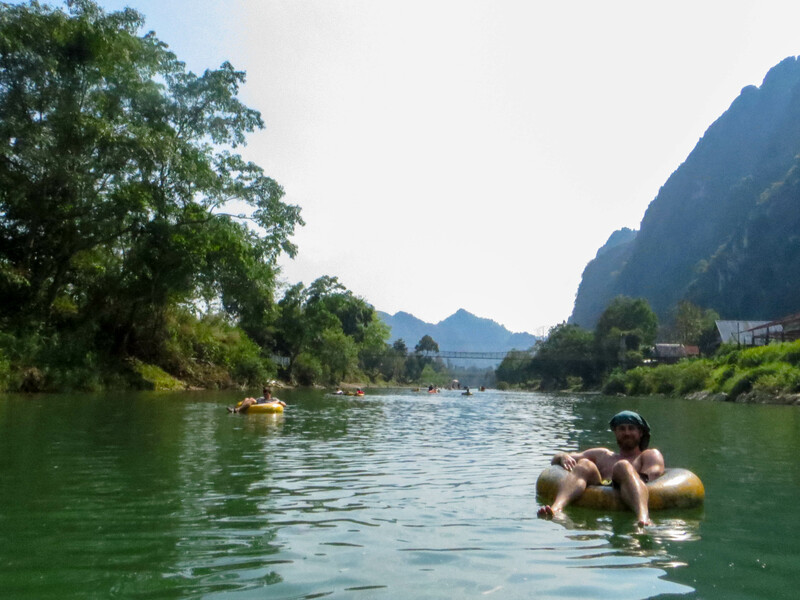 While Vang Vieng may have has lost its luster for many party-minded backpackers, it has more to offer than ever in my eyes. Hopefully a ban on beer can tab necklaces will follow (oh Hailey…).